Our Cycle Vermont Tour was completely redesigned in 2015 and was a huge hit with POMG alumni and new guests alike. We kept the best from the original and magically upgraded the rest. Sign-up today and experience this world class tour! Our Cycle Vermont Tour reflects 23 years of POMG bicycle touring every nook and cranny of the Green Mountain State. 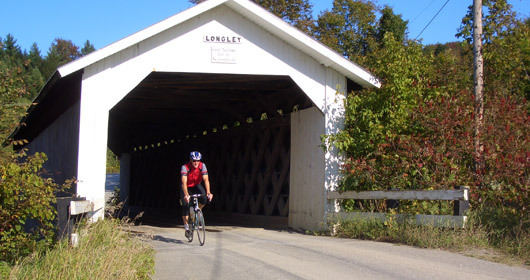 This tour is designed for those who want to experience a big piece of small Vermont, riding the most scenic and diverse routes. 2018 Cycle Vermont is the best of the best cycling in Vermont! We'll enjoy Burlington, one of the most active and livable small cities in the country, then pedal north through the Lake Champlain Islands on our way to the Northeast Kingdom, tackle an optional century ride as well as a couple of mountain gap rides. Of course food and accommodations are central to your comfort and we'll be staying at five inns which will not disappoint. Our tour begins Sunday morning with spectacular views of Lake Champlain, the Green Mountains to the east and New York's Adirondack Mountains to the west. We'll pedal into and out of Burlington on a world-class lakeside bike path. Burlington (pop. 40,000) is Vermont's largest city, cultural center and home to the University of Vermont. White steeple churches, not high-rise buildings, dominating the skyline. We continue north on the bike path, with an option to pedal the “Island Line” causeway to bike ferry, bisecting Mallet’s Bay and the broad lake. The Champlain Islands stretch south from the Canadian border for 30 miles, splitting the northern third of Lake Champlain in two. These narrow islands, four in all, are a cyclist's dream. There are quiet roads, mountain and lake views, small family-run shops in tiny villages surrounded by apple orchards and hay fields. 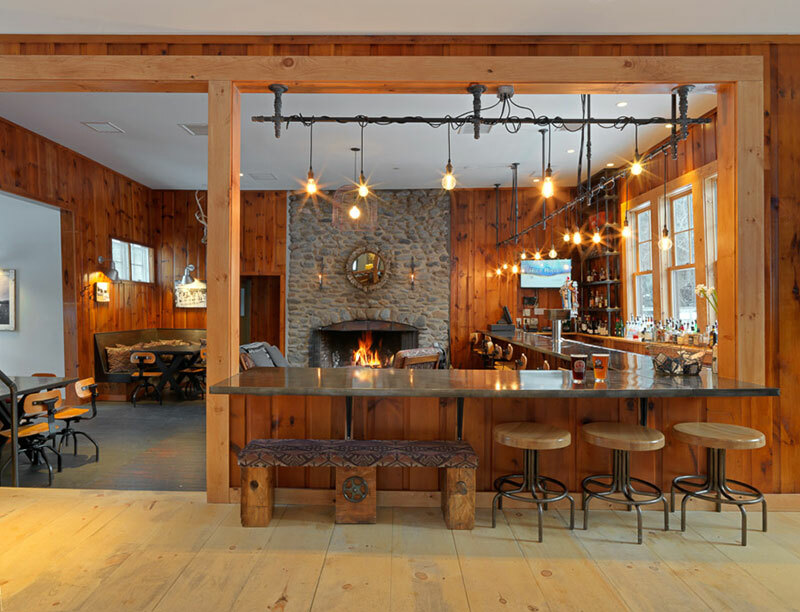 The North Hero House Inn, located right on the shore of Lake Champlain, will be our home Sunday night to relax and refuel on the Inn’s farm to table meals for the journey to come. Monday, we continue north on the islands with Canada not far away. We'll cycle the perimeter of Isle La Motte - the smallest, most remote and least populated of the Champlain Islands - then enjoy easy riding on the West Shore of Alburgh, a peninsula that connects like a “tongue” to Canada. We leave the Islands via the mile long Missisiquoi Bay Bridge, where you will get your first glimpse of the Northeast Kingdom, a cyclist's paradise. We pass by lush dairy farms on our way to Montgomery Center where we'll ride through a covered bridge and finish our day at The INN, a newly renovated inn on the banks of the Trout River. Those interested in an end of day challenge, will tackle the exhilarating optional climb over the Jay Pass. Tuesday, cycling begins over quiet roads through farmland and the sleepy villages of Eden and Hyde Park on our way to Morrisville. We climb to the tiny village of Elmore, home to Elmore General Store, Lake Elmore and Mount Elmore, with it’s fire tower standing sentinel at the summit. From here we cycle a POMG favorite, Route 12, all the way to Vermont’s Capital, Montpelier. Route 12 is 21 miles of lightly traveled, mostly downhill, paradise. 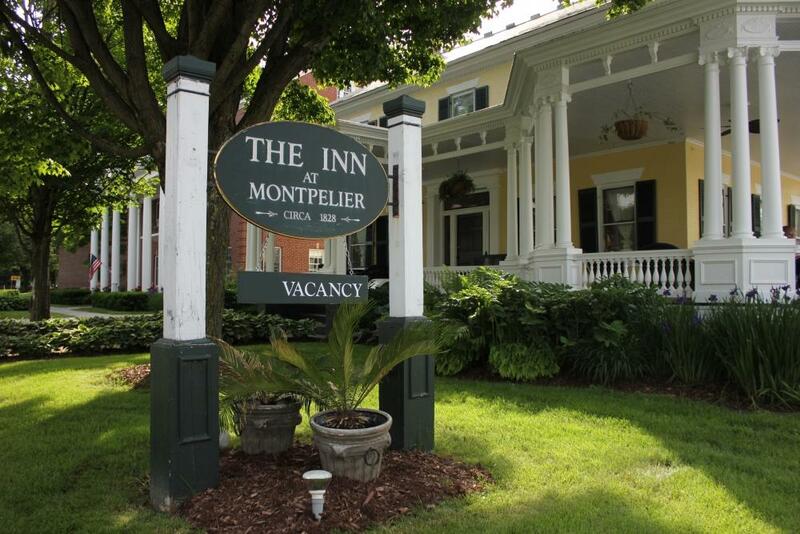 Our home for the night is The Inn at Montpelier, built in the early 1800’s and comprising two stately federal style buildings. The Inn features a Colonial Revival veranda where you can relax post ride and take breakfast the next morning. Montpelier is a delightful walking “city” and the smallest State Capital in the Country (pop about 8000). It is home to foodies, hipsters, students and of course politicians. Close to the Inn, and worth a visit is the Vermont State House, with it’s impressive lawn and gardens inviting you to stroll up the stately steps into the granite building topped by the Ceres, the ancient Roman Goddess of Agriculture. Tonight dining is “on your own.” You select from several great eateries specializing in locally sourced food. The New England Culinary Institute located in Montpelier has two restaurants and has trained many of Vermont’s best restaurant chefs. We depart Montpelier on Wednesday, century day. The ride is 75 miles inn-to-inn with an additional 25 mile option for those ready to tackle a century. We head toward East Montpelier on our way to Barre, home to the Rock of Ages Granite Quarry. Scenic beauty and quiet riding abounds, as we stay on Route 110 through rural Orange County. We'll pass the grounds of the Tunbridge World's Fair (146 years and counting!) on our way to South Royalton, home to The Vermont Law School and a delightful town green and several excellent lunch options including the local Co-op. River valleys surrounded by hills, flanked by dairy farms will melt the miles away. We climb through Bethel and Barnard (swim in Silver Lake if you'd like), where a stop at the Barnard General Store is a must. Reward yourself at their old fashion soda fountain with a chocolate malted or root beer float. Our final stop of the day is Woodstock, where a picturesque town green (with a Wednesday Farmers Market) and covered bridge welcome you for a rest. There are shops, galleries and more. 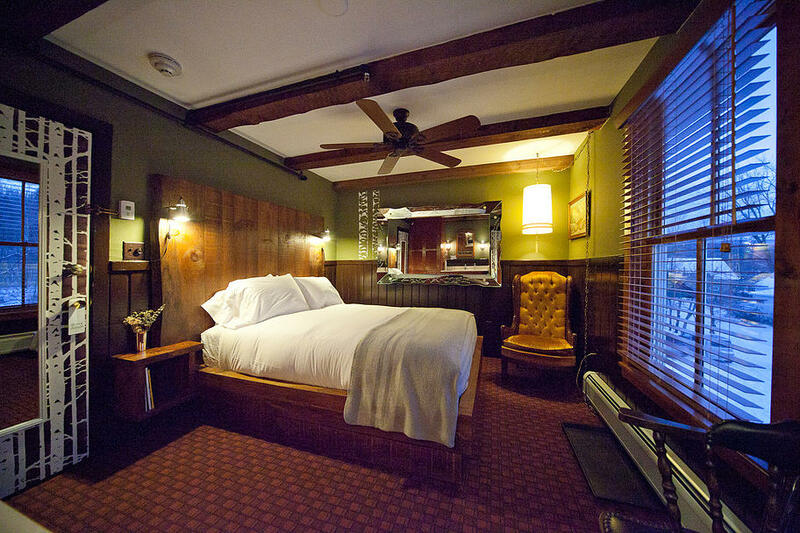 Some may prefer to get on their way to the special care of Chuck and Edie Janisse at their October Country Inn. Home baked breads, homegrown vegetables and eclectic meals have made the October Country Inn a cyclist's favorite for years. Thursday is a gentle and peaceful ride through two different river valleys (the White and the Mad) and through the Granville Gulf Natural Area. You will appreciate this gentler ride after century day. A stop at the Warren Store for fresh-baked goodies or one of their famous sandwiches, enjoyed on the deck, over-looking the river, will give you "Peace of Mind.” We end the ride in the care of Andrew and Heather Lynds at the newly renovated Mad River Barn. 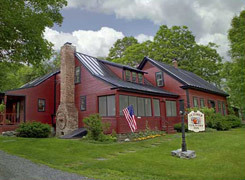 Originally a bunk house for the Civilian Conservation Corps, The Mad River Barn became an inn in the 1950’s. Andrew and Heather have painstakingly gutted and renovated every inch of the Inn while miraculously maintaining the character and history of the Barn. We’ll enjoy our last group dinner at The Barn’s restaurant and pub with several world-renowned local beers on tap. Our tour winds down on Friday, with our return to the Champlain Valley. But first, we ascend the Green Mountains, passing through a low point known as the Appalachian Gap. We top out at 2356' and gaze west to the Champlain Valley and New York's Adirondack Mountains. It's a fast descent into Bristol, a classic old New England village famous for it's outhouse parade on the 4th of July. Finally, we visit Vergennes, the smallest city in the United States and home to an impressive restored opera house as well as one of our favorite French eateries, "3 Squares Cafe" formerly "Eat Good Food!" where we will do just that. 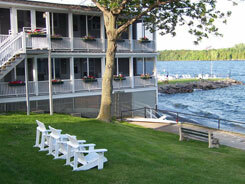 The home stretch finds us on the shores of Lake Champlain where we began six days ago.